The map is of Iran. At the bottom is the Persian Gulf, while the Caspian Sea is at the top. A number of towns and cities are identified, and major roads between them are indicated. The picture is of Muhammad Reza Shah Pahlavi, Shahinshah of Iran. 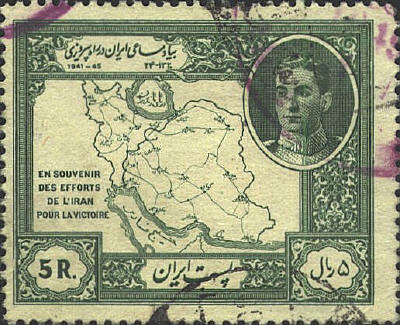 The stamp was issued in April 1949, two months after a failed attempt on the Shah’s life by the Tudeh, the communist party in Iran. 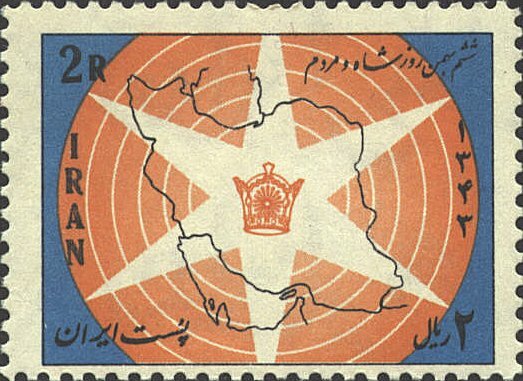 The stamp issued in 1965 marked the third anniversary of the Shah's six socioeconomic bills, symbolized by the six-pointed star. On the northern boundary of the country on both maps the Caspian Sea is indicated. On the first stamp by a sort of medallion with Arabic writing, on the second by two lines extending North which indicate the East and West shores of the Sea. At the South the Persian Gulf is indicated in a similar fashion. Bahrain is the island in the Persian Gulf next to the penninsula of Qatar. The island at the Straits of Hormuz at the East of the Persian Gulf is Qeshum, which belongs to Iran.